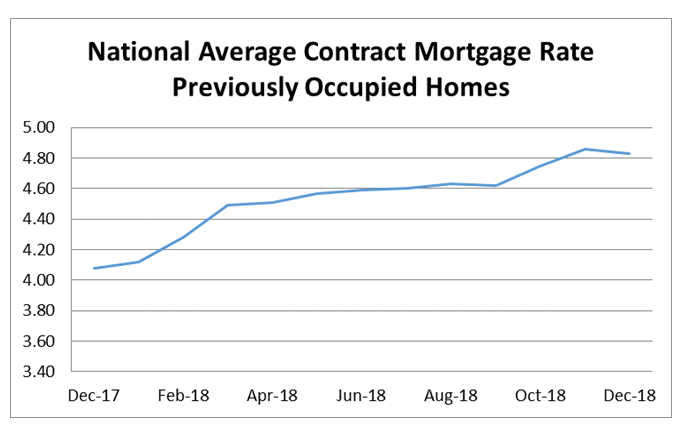 Nationally, interest rates on conventional purchase-money mortgages were nearly flat from November to December, according to several indices of new mortgage contracts. The National Average Contract Mortgage Rate for the Purchase of Previously Occupied Homes by Combined Lenders Index was 4.83 percent for loans closed in late December, down 3 basis points from 4.86 percent in November. The average interest rate on all mortgage loans was 4.82 percent, unchanged from November. The average interest rate on conventional, 30-year, fixed-rate mortgages of $453,100 or less was 4.98 percent, down 1 basis point from 4.99 in November. The effective interest rate on all mortgage loans was 4.92 percent in December, up 1 basis point from 4.91 in November. The effective interest rate accounts for the addition of initial fees and charges over the life of the mortgage. The average loan amount for all loans was $318,600 in December, unchanged from November.